You found THE ONE. You’ve got the ring. The wedding is booked. Now, what about the honeymoon? YOUR HONEYMOON IS THE MOST IMPORTANT TRIP YOU WILL EVER TAKE! And you can’t ever “re-do” a honeymoon, so you have to make SURE it’s amazing & exactly what you want! WOW! The pressure is ON! So where should you begin? Where should you go? How much should you spend? If these honeymoon questions baffle you, Tiki Trips can help… we are your honeymoon professionals! We specialize in planning honeymoons, so we can assist you in the entire process from start to finish. We have booked thousands of honeymoons & romantic vacations over the years… our clients above can attest! We travel extensively, so we know all of the destinations we sell & can tell you exactly what it is like, what your desired resort looks like, what things there are to do there, & in many cases have personal photos to share! So, where to start? Right here, right now, with this course. After you have finished our “Honeymoons 101” course, you’ll be more prepared than ever to start planning your honeymoon! ♥ Issue # 1— Where should you go? This is the biggest question, & this question’s answer is determined by all of the other questions & answers below, so read on. Let’s get the “gut check” question out of the way: quick, without thinking, where have you always dreamed of going on your honeymoon? If your dream has always been to go to Hawaii on your honeymoon, that is something to seriously consider in the honeymoon planning process. If you have not ever really thought about it, that’s ok, too… if that’s the case, where have you dreamed about traveling in general? If a dream trip in your mind is hiking Mt. Kilimanjaro solo, then that’s probably not the dream to focus on for a honeymoon… but if you’d always envisioned relaxing together on a palm-lined Caribbean beach while sipping fluffy concoctions, that is what we want to focus on! So do a “gut check” & see what your gut tells you… you may be surprised! Issue # 1’s answer can also possibly be narrowed down by this question: where you have traveled so far? Have you been to Mexico, but your future spouse has not? Have you both been to the Caribbean but not Hawaii? It’s not always the case, but generally couples want to go somewhere that neither person has been… just keep in mind that general places (“Mexico”, “Caribbean’, “Hawaii”, “Europe” etc.) are BIG areas/regions with MANY places to visit in each area, so don’t necessarily rule out one just because you visited another far-away corner of the same region. In other words, Playa del Carmen, Mexico on the Caribbean side (east coast) is much different & far away from Cabo San Lucas, Mexico on the Baja (westernmost) coast, & VERY different…. the island of St. Lucia in the easternmost Caribbean is very different than the islands of Jamaica or the Dominican Republic in the western or central Caribbean… the island of Maui in Hawaii is very different than the islands of Kauai or Oahu… Italy is very different from France or England or Spain… you get the idea! So don’t rule out an entire region just because you visited one small corner of it. That being said, if you have visited a region, let that work for you… what did you like about it? What did you not like? Would you visit again? These questions & answers can help you focus on the things you liked (& didn’t like) & can help narrow the focus of destinations. ♥ Issue # 2—When should you start to plan your honeymoon? How far in advance? Before or after the wedding is planned? HOT TIP—plan your honeymoon early in the wedding process, not after every aspect of your wedding has been planned. Why? First, you want your honeymoon to be (1) AMAZING… (2) as INEXPENSIVE as possible… (3) to the EXACT PLACE & at the EXACT RESORT & in the exact ROOM TYPE you want. All of this can only be accomplished if you book early! Why? Well, your honeymoon can’t be very amazing if you can’t afford to go where you want because you waited too late & it’s now too expensive OR your dream hotel in your dream room is already sold out! Another reason you want to plan your honeymoon early: your wedding will cost more than you anticipate… we PROMISE! You will always find more wedding things to spend your money on--ALWAYS. And while everyone wants a dream wedding, do you really need that $1500 cake or an extra $1000 worth of flowers? The fact that no one will tell you in the wedding planning process is this: your wedding is not so much about you as it is about being a party for your family & friends, not you! Yes, you are getting married, but at the end of the day, it’s only about 3-4 hours out of your life & the most expensive party you will ever plan & pay for. Your HONEYMOON, however, is ONLY for the TWO of you… not your mom, not your sister, not your friends, it’s JUST for the TWO OF YOU. So would you rather spend extra big money on something you will enjoy for 5-to-10 minutes (flowers, cake, food, decorations, whatever) or something you will enjoy for 5-to-10 DAYS? If money is not an issue—great! But if money IS an issue, spend the money on yourselves (honeymoon) not on something for everyone else (wedding/reception) that no one will even remember or care about later. After all, remember the honeymoon rule: YOUR HONEYMOON IS THE MOST IMPORTANT TRIP YOU WILL EVER TAKE! And you can’t re-do a honeymoon, so make SURE it’s amazing! ♥ Issue # 3—What do you want included? All inclusive means: your hotel stay includes your meals & drinks—yes, alcoholic ones—your hotel tips & some hotel activities. All inclusive is super popular… it makes things easy because you’ll know exactly how much you are spending on your trip… AND while on your trip, you don’t have to worry about what each & every thing costs because it’s included! (Meals & drinks). How nice to enjoy those fluffy cocktails rather than worry how much they are costing. With all inclusive, it’s included! If you definitely want to do all inclusive, then you need to narrow your search to: Mexico, Jamaica, Costa Rica, Dominican Republic, & St. Lucia. Why? These places do the BEST all inclusives. Yes, a few other places “do” all inclusive in the Caribbean, but they do not do all inclusive WELL. What does that mean? The “all inclusive” concept is a fairly new one (it has really come into its own & gone BIG in the last dozen or so years). You want to do an all-inclusive resort that is all-inclusive BY DESIGN. Many resorts that did not previously offer all-inclusive with the hotel stay have recently added the all-inclusive option as an afterthought… meaning they offer just the basics to call themselves an all-inclusive resort to try & stay competitive. The wise traveler does not consider this type of resort as a good all-inclusive to choose. A resort that is all inclusive BY DESIGN is one that, from its origination, it was planned & built as a true ALL INCLUSIVE. This means this type of true all inclusive resort offers much more for the money, usually with more restaurants, more activities, more bars/lounges, resort entertainment, in-room minibar, & other various bonuses. Originally non-inclusive resorts who have turned all inclusive will not offer most of these, & most of the time they fall short of what is offered to the hotel guest vs. an original all-inclusive resort. Honestly, some local destination governments do not support all inclusive resorts because they feel it takes away from the local economy. After all, if a visitor to a destination eats all of his meals at the all-inclusive resort, he is not “supporting” the local economy as he would if he spent a lot on meals & drinks in town. So… because of all of these factors above, all inclusive is best done in Mexico, Jamaica, Costa Rica, Dominican Republic & St Lucia… these independent governments truly support all-inclusive resorts, thereby making them a great price for the traveler! Resort chains that are all inclusive BY DESIGN are: IBEROSTAR, RIU, PARADISUS, MELIA, DREAMS, SECRETS, EXCELLENCE, BARCELO, PALACE, SANDALS, COUPLES, BEACHES, BREEZES, GRAND LIDO, OCCIDENTAL, ROYAL HIDEAWAY, EL DORADO, etc. NOTE: some destinations simply DO NOT OFFER all inclusive at all. HAWAII is one of them, EUROPE is another (with few exceptions). Even if all inclusive were offered in Hawaii, you would not want it to be! Why? Because Hawaii is a SIGHTSEEING, “go-&-do-&-see-&-be” destination, NOT just a “sit-on-the-beach-&-drink” destination. Sure, you can do that, but the point of going to any island in Hawaii is to SEE all the mind-blowing fabulous things there! And you can’t really do that if you are just hangin’ out at the hotel. Other destinations that do NOT do/have all inclusive: U.S. destinations, cruises, Canada, Europe, Asia, Australia, Africa & anyplace else. Though there is the rare, expensive exception, “all inclusive” is pretty much a Mexico/Caribbean/Costa Rica offering. FYI, cruises just offer MEALS, NOT DRINKS (alcohol & sodas are NOT included on a cruise), NOT EXCURSIONS & NOT TIPS. That’s right, cruises are NOT ALL-INCLUSIVE! So don’t be deceived into thinking you’ll be able to drink all the sodas, beer, & cocktails your heart desires on a cruise or do the port excursions or not have to tip anyone, either… WRONG! You will be paying a hefty bill for all of these things when the ship docks! If you do not want all-inclusive (or it is not that important to you), then your options are wide open… the world is your oyster! And you don’t HAVE to do an all-inclusive in Mexico, Jamaica, Dominican Republic, St. Lucia or Costa Rica… but it’s a fantastic & recommended idea for those destinations since they do them well & are a great price! Let’s be realistic: nothing worth having comes cheap. NOTHING. Just like if you are buying a car, the more you spend, the more you are going to get! You can’t buy a new Lexus for a Kia price. You can’t get a Corvette with a Chevette budget! That being said, we at Tiki Trips will help you stretch your budget as far as it can possibly go, but we don’t walk on water! So you need to seriously take financial inventory & decide what you have to spend. Some folks don’t know where to even START to set a budget because they are not sure what things cost. Here is a REALISTIC budget list (below) of what you should expect to spend. And before you read on, remember again that nothing worth having comes cheap. Nobody wants to buy garbage, therefore we don’t sell it nor recommend it. So… this ballpark budget is a place to start for a decent, respectable, desirable, 4-star accommodations & nicer trip! And we recommend 5 nights as a bare minimum on closer destinations (7 nights or more on faraway ones), though we’ll do 3 nights to 14 nights, or however long you want to stay. Most folks stay at least 6-7 nights on a honeymoon, so keep that in mind. DO NOT ETCH THESE PRICES BELOW IN STONE NOR USE THESE AS A QUOTE for how much your trip is going to cost… this is just a GENERAL GUIDE. If you want a definite price, we need definite dates, place, hotel, & many other things to give you an accurate price. Note: Holidays & more popular seasons (Spring Break, summer) can be more expensive, so be sure to keep that in mind. Here goes! Yes, you can do a resort in Mexico that is NOT all inclusive, but you will spend about the same or more regardless. If you are wanting a high-end, “movie star hideaway” type of celebrity-popular resort, they have several hidden spots like this throughout Mexico… & be prepared to shell out big bucks for these! Yes, you can go to a different Caribbean island (St. Wherever!) than Jamaica, Dominican Republic or St Lucia, but again, you will be paying the same or more for NON-inclusive, FAR more, either way. And of course, if you are wanting a high-end “movie star hideaway” type of celebrity-popular resort, they have many hidden spots like this throughout the Caribbean islands… & be prepared to shell out even bigger bucks for these! Advisory: You don’t really get any “beach” time on a cruise! Cruises are all about pulling into different ports for short periods, therefore you don’t really get any beach time. A cruise is best for the sightseeing in a variety of ports. Again, DO NOT ETCH THESE PRICES ABOVE IN STONE nor use them as a quote for how much your trip is going to cost… this is just a GENERAL GUIDE. If you want a definite price, we need definite dates, place, hotel, & many other things to give you an accurate price! Cost of your trip all depends on availability (how available or sold out it is), time of year (holiday weeks & popular times—Spring Break & summer-- are more expensive! ), if you are traveling in high or low or middle season, how early or late you book, where you are departing from & how far you are flying, hotel chosen, room type chosen, other inclusions (car, train, transfers, etc.) & other factors. ♥ 1—ONLY A DEPOSIT IS REQUIRED TO RESERVE YOUR TRIP! Unlike the internet, Tiki Trips only requires a deposit for your honeymoon, typically from $150-$500 (maybe more, depending on destination), NOT full payment at time of booking. That is EXCELLENT NEWS! That’s right, you do NOT have to pay everything up front. Many honeymooners can end up affording a nicer, better trip because they can “pay as they go” & only put down a deposit when they reserve; final payment isn’t due until 60 days or so before their departure date. Very do-able! ♥ 3—Don’t leave for your honeymoon until at least 36 hours after your wedding. TRUST US ON THIS. Your wedding is the biggest event of your life. Think about it: your wedding day is all of the following: (1) a wedding, (2) a religious service, (3) the biggest & most expensive party you will ever throw, (4) the best dressed you will ever be, (5) a family reunion of BOTH your families… ALL ROLLED INTO ONE. You will be beyond exhausted. So do you really want to then get up at the crack of dawn to go get on a plane the following morning? You gotta be kidding! Leave 36 hours after your wedding (the Monday morning after your Saturday night wedding, for example). This would give you some time to decompress the following day, relax, say goodbye to family & friends, remember what you forgot to pack & finish doing so, & be properly prepared mentally & physically for your honeymoon before leaving for it. The perfect way to go! ♥ 4—Do the nicest, “biggest” trip you can for your honeymoon. After all, when it’s all said & done, it’s all about the “braggin’ rights”! When your honeymoon is over, there are only 3 things left: your memories, your pictures, & the BRAGGIN’ RIGHTS! Yep, we said it, & it’s true. You want to do the nicest trip you can… because you will be able to brag about your fabulous honeymoon for the rest of your life! “Ah, we honeymooned for a week in heavenly Hawaii in our own private villa”… OR “we spent our romantic honeymoon week in St. Lucia with our own private pool…” is far better than “we spent a weekend in Cancun”! Unless you have a very limited budget, go farther/do more/stay longer… your honeymoon is the most important trip you’ll take, remember? And remember that “honeymoon rule”-- you can’t ever “re-do” your honeymoon-- so do the best, most memorable one you can afford. You can ALWAYS go to Mexico for a quick weekend trip anytime throughout the year, so if you can afford to do something bigger, farther & longer, do it! ♥ 5—Be realistic on how far you should go. Not to contradict # 4 above, but do you really need to take four planes to go all the way to Bali or a remote part of Europe for your honeymoon & travel for an entire DAY just to get there? Be realistic. As stated in # 3 above, your wedding day is the biggest event of your life for many reasons. Unless it is your lifelong dream to go to Thailand or Italy (or somewhere else far away) & you are mentally prepared for some tough travel, don’t try to commit “travel suicide” by flying forever to get to your out-of-the-way honeymoon spot (14- 24 hours travel time or more)… the jetlag will really whammy you, & remember, you were exhausted even before you started the trip! ♥ 6—Don’t cheat yourself out of a nice, quality honeymoon. Everyone wants to pay the least amount they can for anything, naturally. Just don’t cheat yourself out of a nice honeymoon by trying to go cheap. Do you really want to stay in a budget hotel for your HONEYMOON? Come on, splurge a little. Do the nicer resort. Go to a different place farther away. It will be more memorable, you’ll avoid certain problems & issues (like the two of you fighting about why you chose a dumpy hotel with bedbugs!) & you will be glad you did it better! ♥ 7—Don’t cheat yourself out of a decent stay. Some folks feel they have to hurry up & get home. Why? Do you REALLY have to hurry home? Come on, think about it… the world is not going to come to an end because you stayed an extra day or two on your trip. It’s your HONEYMOON. Remember, that once-in-a-lifetime thing? That’s what we’re talking about! You will have the rest of your life to worry about work, bills, house, kids, family, & other obligations. So TAKE THE TIME, FOR YOURSELVES, TO REALLY ENJOY YOUR HONEYMOON. You’ll thank us later! ♥ 8—(A) It is no big deal to get a passport. Really. So don’t rule out a foreign country just because you are too lazy or cheap to get a passport. A passport is about $100-$200 (depending on if you expedite it & send it through private channels). It won’t take very long to apply & is pretty easy to do. And a passport is good for TEN YEARS!! (B) Yes, you really DO need a passport—a VALID passport-- to go to Mexico, Caribbean islands, Canada, & all other foreign countries. No more birth certificates or voter’s registration cards. You won’t be getting on the plane for your international-destination honeymoon without that valid passport! (C) You don’t need a passport to go to anywhere in the U.S., Hawaii, Alaska, Puerto Rico, & the U.S. Virgin Islands. Hawaii is the 50th state, Alaska is the 49th state, & the other 2 are U.S. territories (almost a state!). So if you need to stay in the U.S. for legal or personal reasons, these would be something to consider! ♥ 9—Don’t overschedule yourself on your honeymoon. It is tempting to sign up for all these extra activities/excursions/tours at your destination. We recommend being busy/scheduled about half of the time at the most. Therefore, if you are going to Hawaii or Costa Rica or Europe where the long list of activities is quite tempting, schedule an activity every OTHER day. We’ve had honeymooners get too excited & overschedule themselves, & then they have no time to ENJOY their honeymoon… they have to get up at 5 am for a snorkel tour, followed by a helicopter ride at 10 am, then a bike trip at 2 pm, followed by a dinner cruise at 6 pm, etc. Slow down, relax, stop & smell the flowers! ♥ 10—Pick a honeymoon destination on which you both agree. If you really don’t want to go snow skiing on your honeymoon & your future spouse does, talk about it, compromise, decide on something together. The honeymoon destination is usually—not always, but most of the time—more important to a woman than it is to a man, frankly. And guys, here is a wise ol’ fact you need to learn before you get married: if mama ain’t happy, ain’t NOBODY happy! So choose a honeymoon destination together… don’t be “punished” for the next decade (or lifetime!) by your spouse because you just wouldn’t go to “St. Something Island” for your honeymoon! If you demand to go to Place A & your future spouse is demanding to go to Place B & you just can’t come to an agreement, then why not compromise on something completely different, Place C? Just an idea. If you are simply “stumped” & can’t come to a compromise, call us… you might be surprised at some “combo” trips we can create to make both the bride & groom happy! We hope this information has helped you in your honeymoon planning process… call us if you have questions, ideas & to get started… we are here to help you plan the perfect honeymoon for YOU! Contact your Tiki Trips HONEYMOON, DESTINATION WEDDING & VACATION SPECIALIST today! Your Tiki Trips agent has been there! 1-877-999-1009--toll free across the U.S.A.
We so appreciate your referrals… they are the greatest compliment you can pay us! We SPECIALIZE in VACATIONS, HONEYMOONS & DESTINATION WEDDINGS! with a fun group of friends? Come go with us, the TIKI HEADS! 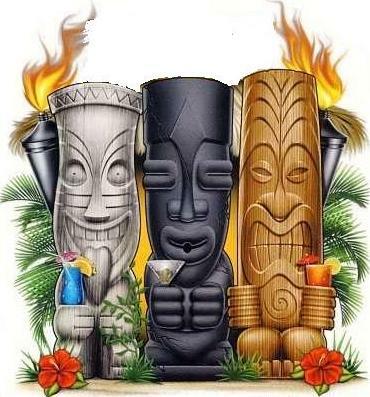 http://www.tikitrips.com/future -- Future upcoming Tiki trip specials around the world! http://www.tikitrips.com/strongarm -- Dangers of booking on the net vs. safety/security of Tiki Trips! Have your wedding or event decorated for less hassle & cost than doing it yourself! All payments are non-refundable once made; please be certain of wedding/travel plans before payment. PASSPORTS ARE NOW REQUIRED FOR U.S. CITIZENS TRAVELING TO ALL INTERNATIONAL DESTINATIONS (including MEXICO, CARIBBEAN ISLANDS & CANADA)... get one soon! (Passports can be obtained through your local gov't tax office or main U.S. post office… please visit our website's main page at the bottom for more helpful info on obtaining a passport). If you are not a U.S. citizen, please check your country’s consulate as to what is required for your travel. Don't forget to re-confirm all flights with the airline 24 hrs prior to travel for any last-minute changes, & be sure to arrive at the airport 2 hrs before departure with proper identification. Happy travels!